I once lamented the long waiting periods between metagame shifts. Innovation takes time, I thought. Eye-catching technology doesn’t ceaselessly flow from premier events. Except, it seems, in Modern. UBx Faeries has always seen some amount of play among the tribe’s dedicated fanbase, but nothing could have prepared the Modern community for Anthony Huynh’s shocking 13th-place finish at GP Pittsburgh. Faeries has historically sucked in Modern, but Huynh barely missed the Top 8 on breakers. Huynh is one of the Faerie-philes I allude to above, and he’s been piloting U/B builds since before April of this year. Winning 5th place in a StarCityGames IQ netted him a Wizards.com feature from Melissa DeTora (which unfortunately omits his decklist) and may have partially inspired David Daniel’s 19th-place, Ashiok-fueled deck from GP Charlotte. I’m more Delver-4-Ever than Spellstutter Lover, but the marquee two-drop definitely impressed me when I first played with it. Shortly after Innistrad‘s release, I messed around with a RUG Faeries deck that drew groans by Spellstuttering Path to Exiles aimed at my Tarmogoyf. Discovering a certain tribal instant brought my build into black for the first time. My tempo tendencies incited me to pull UBx Faeries away from Huynh’s midrange starting point, which meant cutting splashy curve-toppers like Mistbind Clique. 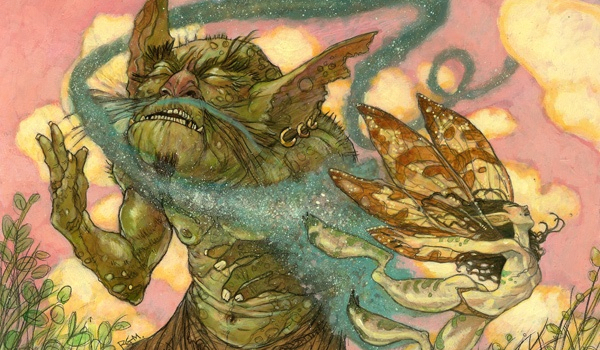 This week, I’ll discuss the pillars of interaction in Modern and unveil BUG Faeries. Modern decks are either linear or interactive. Linear decks ignore opponents to quicken their own gameplans, and include Burn, Affinity, and Grishoalbrand. Interactive decks seek to trade resources with opponents and frequently win in methods widely considered “fair,” such as attacking with efficient creatures. These decks include UR Twin, Jund, and Jeskai Control. U/B Faeries, Esper Control, and WB Midrange have never secured those coveted spots in Modern’s top tier because they break the format’s unspoken, cardinal rule: if you want to interact, you have to run Lightning Bolt or Tarmogoyf. These two spells are so dramatically undercosted for the versatility and leverage they provide that any deck playing fair wants one or both. Without them, trudging through Modern’s carnival of blistering linear decks becomes unbearable. The exception to this rule: interactive, creature-based aggro decks like Merfolk and Elves, which rely on synergy to get over the Bolt-and-Goyf hump. These decks are still more linear than their spell-based cousins. In my eyes, the U/B Faeries lists we’ve seen in Modern are clearly spell-based, so this exception does not excuse them from the format’s splashing prerequisite. Both Sheridan and I have written about Lightning Bolt‘s uncontested Modern authority. We noted in our respective articles that the “Bolt Test” influences creature choices across the board, while immediately invalidating a host of otherwise worthy strategies. Tarmogoyf, too, warps Modern’s landscape around himself. Aggressive two-drops are always measured against the spiky green yardstick. Just as Modern players deliberately sleeve up Bolt-proof cards like Restoration Angel and Teferi, Mage of Zhalfir, many have come to lean on toughness-specific answers (Flame Slash, Dismember, Roast) to diffuse the Goyfs they expect to encounter. A truly formidable Tarmogoyf exceeds his kind’s habitual 4/5 stats to resist these removal spells and crush Siege Rhinos in combat. In a deck naturally packing tribal enchantments, this is our Tarmogoyf. Huynh’s Pittsburgh results bode well for Faeries in Modern, but one high-profile finish does not a top-tier deck make. My theory about Bolt and Goyf dooms the interactive U/B deck to Modern failure. Including red or green can remedy this issue. Jeff Hoogland’s recent Grixis Faeries deck chooses red for Bolt-Snap-Bolt, while I’ve obviously splashed in the other direction for Tarmogoyf. Since we’re already black, green also gives us Modern’s scariest catchall removal spell, Abrupt Decay. And to beat those pesky x/1s, the format’s deeper-than-you card pool has us covered… with Peppersmoke. A couple cards I’ve always wanted reprinted for Modern abuse are Divert and Disrupt. The former punishes tapped-out opponents by redirecting a malevolent Lightning Bolt to their own creature. The latter Force Spikes everything from Serum Visions to Cruel Ultimatum and sugarcoats things with those three magic words: “Draw a card.” Timed precisely, Disrupt is a one-mana Cryptic Command; in theory and practice, so is Divert. And so is Peppersmoke. Imagine the best-case scenario: shooting Pestermite in response to Splinter Twin with a Bitterblossom in play. That’s like, a 3-for-one? Just think of the mana advantage! Peppersmoke‘s sheer potential for backbreaking conditional plays is the real reason I’ve sleeved up my Spellstutter Sprites. That, and its tribal sub-type. I mean, picture Smoking Grim Lavamancer in response to a Roast pointed at garden-variety Tarmogoyf. I’m getting chills just typing this stuff. Being really cute may get you far in life, but it won’t earn you a Modern trophy. 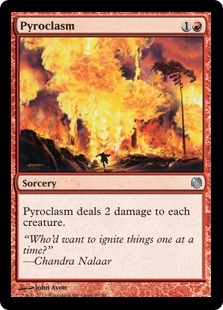 I wouldn’t run Peppersmoke unless it addressed a problem common to all non-red decks. Many cards see Modern play despite dying to Lightning Bolt. Birds of Paradise and Noble Hierarch, Glistener Elf and Blighted Agent, Signal Pest and Steel Overseer, and Dark Confidant and Young Pyromancer all succumb to the mighty red instant, but are mostly cheap enough to break parity with Bolt on mana. These threats have something else in common: if your opponent doesn’t have Lightning Bolt, he’s in for a world of pain after they resolve. Bolt’s ubiquity gives players little reason to play x/2 or x/3 creatures over their more efficient x/1 counterparts, and Peppersmoke takes advantage of this predicament by acting as a Bolt with upside in a surprising number of matchups. Hatebears and Infect can steal games from non-red, interactive lynchpins like Abzan as their one-drops go unanswered. Twin and other red decks suppress such strategies with Lightning Bolt. In BUG Faeries, Peppersmoke works alongside Disrupting Shoal to prevent them from getting ahead. I mostly see Electrolyze resolve as a no-landfall Searing Blaze with cantrip. Peppersmoke lacks the versatility of occasionally killing two creatures, but the sizable mana reduction more than compensates. Electrolyze doesn’t see more play than it does because it cannot deal with must-answer x/1s early in a game, whereas Peppersmoke is happy to remove a first-turn Delver of Secrets without cantripping. For perspective, any red deck would have spent a precious Lightning Bolt on the Wizard in a heartbeat. -1/-1 for a single black mana isn’t a game-changer. The Esper decks I mentioned before ran Disfigure to deal with early threats. That card has numerous problems, most notably that it’s dead weight in some matchups. (Clever, huh?) Peppersmoke can at least target a friendly creature to cycle into something else, and it grows Tarmogoyf for future attacks. Before dismissing a cantripping, Goyf-specific Battlegrowth as “not worth it,” remember that Patrick Chapin ran Mishra’s Bauble for this exact reason in his Temur Prowess deck. And don’t forget that’s just Peppersmoke‘s throwaway mode. I’d argue that sniping early-game enablers in a color combination that has no business doing so trumps Bauble’s micro-synergies with fetchlands and Abbot of Keral Keep. I’ve always liked Darkblast as an early removal spell in non-red decks. In a pinch, and at the cost of a draw step, it does a tasteless but adequate Disfigure impression. The rest of the time, it slays Snapcaster Mage, Vendilion Clique, and whatever other frail body “decks that don’t care about Lightning Bolt” throw at you. No card is faultless, however. Darkblast has the same problem as Disfigure in that when it’s dead, it’s really dead. I’d also rather have cantripping conditional removal against Snapcaster decks than a recurring -1/-1 effect. Add to that Peppersmoke‘s favorable interaction with our own Snapcasters, and the fact that it makes Tarmogoyf larger than Tasigur, and it’s a no-brainer over Darkblast in the Faeries deck. I’d only favor Darkblast in matchups where a -1/-1 effect is really strong, but our Peppersmoke/Snapcaster package already ensures we dominate those. Smoke’s utility elsewhere makes it truly superior. It wouldn’t be Faeries without a big pile of countermagic. Spellstutter Sprite: The main reason to play this archetype at all, Spellstutter Sprite has relevance throughout the game and counters just about anything with a Bitterblossom on the field. Nabbing one- or two-mana removal spells targeting Tarmogoyf and Tasigur is often game-winning. Early on, we counter whatever Sprite can get her tiny hands on; as Faerie Rogue tokens begin to pile up, we save her for our opponent’s few outs to the armada. Disrupting Shoal: My darling counterspell and one of Modern’s sleepers. UBx Faeries is notoriously slow, and Disrupting Shoal allows us to cast Visions into Goyf or Bitterblossom and still neutralize an opponent’s play. In longer games, Shoal becomes Spell Blast and makes for a deadly recursion target with Tasigur. Spell Snare: I started with two of these and loved them. Unfortunately, I had to cut one for the third Mana Leak. Spell Snare hits Modern’s best cards and is easily flashed back with Snapcaster Mage. It’s always tempo-positive and has prime targets in every matchup that doesn’t cascade into something Spellstutter Sprite counters. Mana Leak: This deck loses to a resolved Wurmcoil Engine. Or Sun Titan. Or Hornet Queen. Mana Leak counters these big, ugly creatures, and pitches to Shoal against lower-curve decks. Stubborn Denial: These started as Spell Pierce, but I had ferocious regularly enough to try Stubborn Denial. With a fatty on the table, Denial ruins desperate removal attempts. It also organically counters on-curve planeswalkers and spells like Kolaghan’s Command for huge tempo swings. A beating with Snapcaster, but I wouldn’t run more than two with just six ferocious enablers. The first rule of brewing is not to assemble a worse version of an existing deck. As I built and tested BUG Faeries, I compared it to BGx and Delver variants to make sure I wasn’t insulting them. We don’t lose our midrange matchups with this deck. So far, BUG Faeries has tested very well against Jund and Grixis. The former doesn’t stand a chance with its x/1 Confidants and lackluster Bolts. Flash creatures, Mutavault, and Bitterblossom tokens make Liliana embarrassing. Snapcaster Mage and Serum Visions keep us from running out of gas, and our Goyfs tend to stick around longer than theirs thanks to flashbacked Abrupt Decays. Blossom gets out of hand quickly for Jund and Grixis, so it frequently draws the Decay itself, making Tarmogoyf all the bigger. Spellstutter Sprite and Stubborn Denial give us tremendous late-game staying power in both matchups, since they hard-counter everything. Dispel from the sideboard does a number on all blue midrange decks, and Abrupt Decay hoses Twin variants of every color combination, Grixis and otherwise. Modern’s black midrange decks beat us when they resolve Tasigur, or something really stupid like Grave Titan, through our Mana Leaks. Even then, it’s possible a swarm of Faerie Rogues or sated Goyfs kills them anyway. Tasigur also boosts our resilience to midrange strategies, since he comes down for cheap in a deck so loaded with interaction and actually stabilizes once he does. A single Stubborn Denial can take opponents off answers. Then, Tasigur recurs that very counterspell and locks up the game. As with our other cards, Tasigur’s strength lies in his versatility; against faster decks, he’s extra copies of Tarmogoyf. In the deck’s early stages, I had to choose between Tasigur, the Golden Fang and Dark Confidant. I liked that Sprite protects Confidant from Lightning Bolt, albeit a turn later, and Bob’s synergy with Disrupting Shoal. But without Confidant, my opponent’s Lightning Bolt has zero superb targets. While Delvers would help against linear big-spell decks like Tron, I don’t think they’re worth giving 50% of the Modern field something significant to do with their burn spells. Adding Delvers also brings us too close to the badly-imitating-another-deck line. Peppersmoke shines here. Bitterblossom pumps out blockers to trade with Signal Pest and Memnite, and Abrupt Decay is a maindeck out to Cranial Plating. Disrupting Shoal also counters a lot, and Tarmogoyf provides an enormous clock once we’ve disrupted them enough. Game two, Snapcaster-Nature’s Claim and our suite of discard effects make things even harder for Affinity. They count on Spellskite hassles to protect their threats, but we pack seven efficient answers for the Horror. Etched Champion can prove annoying on the ground, but as long as Plating doesn’t stick, Faerie Rogue tokens will get us there. Goyf and Bitterblossom compete for removal, and Jund’s own Goyfs hardly stick against Snap-Decay. Huntmaster and Tasigur are dangerous if we don’t get ahead first or meet them with Mana Leak. It’s usually managable to protect our threat past a vital removal spell with Shoal or Denial. Game two, Deathmark makes a lot of noise from the sideboard. Spellskite + Dispel messes up Kolaghan’s Command and helps out-resource Jund players. If they haven’t seen Peppersmoke, their Confidants stay in, giving us another way to two-for-one them. I’ll admit, it looks bad on paper. Bitterblossom and Peppersmoke don’t “blow smoke” against Burn; they blow, period. But the combination of Tarmogoyf, Tasigur, Disrupting Shoal, Spellstutter Sprite, Stubborn Denial, and Abrupt Decay takes care of Burn in game one. We also don’t take much damage from lands if we’re careful. Game two, things get really fun. Inquisition of Kozilek and Feed the Clan make Snapcaster Mage really strong, and plucking Bitterblossom and Peppersmoke from the mainboard accommodates Spellskite and Dispel. Here’s a deck that smashes conventional U/B Faeries, but can’t survive Shoal + Peppersmoke. Game one is a massacre, and things only get meaner with Nature’s Claim, Spellskite, Deathmark, and discard. Decay keeps Twin off the combo, and Peppersmoke blows them out. They draw too many lands and we end up out-carding them. Like Grixis Twin, they can’t handle Bitterblossom. Unlike Grixis Twin, they also can’t handle Tarmogoyf. See U/R Twin. Even softer to Dispel. This matchup goes both ways. If we Shoal a crucial Amulet or Summer Bloom, and follow with pressure, things look really good. Spellstutter Sprite hard-counters Pacts, and Mana Leak on a Titan or Hive Mind means the game. But there’s very little to do against Cavern of Souls. Game two, discard does a lot of work. As with Tron, we have to pressure fast and hope we can disrupt them long enough to win. Merfolk can spell trouble with a grip of Spreading Seas, which does a swell job disrupting our mana. Otherwise, we’re the clear favorite, Shoaling or Decaying their Aether Vial and ripping up the board with our removal package. Trading Peppersmoke for Silvergill Adept, or Peppersmoke plus a Faerie for Lord of Atlantis, is also a blast. Game two, Merfolk doesn’t really improve against us. Our discard pulls its weight, and Nature’s Claim comes in to eat Aether Vial and Spreading Seas. Game two, we add Thoughtseize and Deathmark and try to ride Snap-Visions to a win. I remove Peppersmoke in this matchup, even though it trades up with a Lingering Souls token; my plan against that card is to draw Stubborn Denial on time. If that sounds bad, it’s because it is. The rest of the matchup plays out favorably; see Jund. Tron has traditionally posed a huge problem for midrange decks, and BUG Faeries is no exception. Thanks to Mana Leak, Snapcaster Mage, and Stubborn Denial, we have a better time preventing haymakers from resolving than Jund or Abzan do. Still, Pyroclasm chewing through our Faerie squad is no fun. Game two, we try to trade Nature’s Claim for Expedition Map and Thoughtseize away the nasty cards. It’s important not to board out threats in this matchup, since we need fast pressure. Not having Blood Moon stings. Deathmark: A criminally underplayed removal spell that kills Modern’s hardiest creatures. Deathmark profitably removes Tarmogoyf, Siege Rhino, Huntmaster of the Fells, Wilt-Leaf Liege, Scavenging Ooze, Ajani Pridemate, and weird stuff like Baneslayer Angel, Champion of the Parish, or Hooting Mandrills. Also nabs Noble Hierarch when we don’t open Peppersmoke. Dispel: Shores up our spell-based matchups. Favorite targets: Terminate, Gifts Ungiven, Cryptic Command. Feed the Clan: Makes it impossible for decks to reach us out. Players that see Bitterblossom and decide to put all their Lightning Bolts at our heads are in for a rude awakening. Crushing with Snapcaster Mage. Nature’s Claim: A Snapcaster-friendly Naturalize. Extremely versatile; comes in for Bogles, Pillow Fort, Tron, Affinity, etc. Since Tarmogoyf and Bitterblossom grow incrementally, four life is well worth the mana rebate. Unnecessary for tech like Vedaklen Shackles or Choke, since Abrupt Decay destroys those. Spellskite: For decks that trade their cards for damage, such as Burn and Small Zoo. Terrific against strategies that target their own permanents like Bogles and Infect. Blocks Etched Champion in Affinity and slows Twin combo way down. Combines with Dispel and Stubborn Denial to seriously disrupt Kolaghan’s Command decks. Also comes in against removal-heavy control strategies like Jeskai. Thoughtseize: A proactive answer to hand-sculpting decks like Ad Nauseam and Tron. Tears synergy decks apart. Strong include in aggro matchups since it trades with a threat, especially on the play; on the draw, I prefer Disrupting Shoal. Inquisition of Kozilek: Better than Thoughtseize with life on the line (against Burn, Zoo, Hatebears, etc.). Still comes in against combo decks. I prefer to play exclusively tempo-positive interaction in game one and board into discard effects. After so much fiddling with Blood Moon decks, it feels amazing to cast Disrupting Shoal again. I’ve yet to get my hands on an actual playset of Bitterblossom, so I’ll probably take something with Delvers to the Mana Deprived Super Series this weekend. In the meantime, I encourage interested readers to sleeve up BUG Faeries, especially those who question my card choices. For me, Modern’s at its most exciting when it pushes deckbuilders out of their comfort zone. Lord knows I spend enough time pushing Tarmogoyf out of his. Next Post: Trevor Holmes Plays MTGO Ep. 10: U/B Faeries! As cute as this deck seems, the list is 3 cryptic commands short of a good deck that would 13-2 a GP. Cryptic is pretty bad when it takes you on average six turns to make four land drops. It’s also implied that you’re 5 lands short as well. Gotcha. That’s a different deck. It’s impossible to play enough blue cards to squeeze Shoal into that shell, and I don’t think Faeries is fast enough without it. At least, not the kind of Faeries I want to play; it works with Damnation effects I guess, but personally, I’m really not a fan of cards that cost more than two mana in general. What’s about that said reach? When you just run out of cards and even snapcaster isn’t enough for you because you play no burn. Two Mutavaults in format where everyone seem to play ghost quarter in main deck? Yes, there’s Bitterblossom, but is it enough? Though I have no experience playing that deck and can just express my concern. Bitterblossom isn’t enough, which is why I play Goyf and Tasigur. This deck is indeed very fun. I brought it to a local tournament tonight and had a blast, playing a bunch of matches and going 5-1. Went 2-0 against Burn, 2-0 against Ad Nauseam, 2-0 against Eggs, 2-0 against UW Emeria Control, 2-0 against Soul Sisters, and as expected, 0-2 against BW Tokens (losing twice to Ajani Goldmane). To my chagrin, Peppersmoke sat in the board for every matchup except Soul Sisters, but opening Bitterblossom, Goyf, and double Smoke against that deck game one made up for it 😀 As I said in the article, Smoke really helps in otherwise tough matchups that can get ahead of us. If it’s bad in already favorable matchups, that’s fine; we’ll just board them out there and win anyway. That said, I moved one Peppersmoke to the side and cut the Spell Snare from my list to play two Probes, which have been sweet. The info is superb in this deck, and I like having more blue cards for Shoal. Since the Burn matchup is so good, I figured we could play some Probes. IMO most blue decks that don’t lose to Burn should run them. I wish we could fit discard effects into the mainboard, as they’ve been all-stars from the side, but we can’t without weakening Shoal the deck’s true enabler. Without Shoal, the Faeries deck doesn’t have time to do anything in Modern, which I consider much too fast for traditional shells. Is your local LGS meta always so combo heavy? I wonder how this deck would fare in a meta rife with fast clocks. You say the infect matchup is good, but what about Nacatl decks? Considerations for Painful truths? this build can sustain the damage better than Grixis in general. possibly by cutting 1 decay and 1 leak. I agree with your assessment with regards to mutavault unless you’re in a tron / amulet saturated meta i wouldn’t switch them for ghost quarter. As for your sb if you’re on a wedge as you already said EE is a great catch all i think cutting 1 dispel and 1 thoughtseize to have that kind of answer is worth it but again its meta dependant and it grows the goyf even more. The games I lose with this deck are due to flooding out on expensive cards like Leak and Snap as opponents beat me up with one-drops. Painful Truths would only exacerbate this problem and contribute nothing to the harder matchups. I was worried this was going to be more 3-drop garbage like most Faerie decks. I’m pleasantly surprised. I’d hardly consider this Faeries – it’s more like BUG Tempo with a touch of Faerie synergy. I’d say it’s a pretty good deck in spite of that, but I’d be tempted to just ditch the Peppersmoke (or sideboard it) and mainboard the IoK. I’d hardly consider this Faeries – it’s more like BUG Tempo with a touch of Faerie synergy. I’d say it’s a pretty good deck in spite of that, but I’d be tempted to just ditch the Peppersmoke (or sideboard it) and mainboard the IoK. I feel that the sideboard needs some sort of sweeper (Damnation, EE, heck, even Maelstrom Pulse) as well. IOK is definitely better than Pepper in certain metagames. I like that Pepper shuts down Modern’s faster aggro decks and disrupts synergy, while not being dead against other decks in game one. IOK is an always tempo-negative play that doesn’t deal with resolved permanents. What matchups would you want a sweeper effect for? The only time I’ve lost to a bunch of creatures so far in my testing is against tokens, sometimes out of non-“Tokens” decks like Abzan. Affinity has been fine. Granted, I haven’t tested against CoCo, but I think Dispel, Denial, Peppersmoke, Decay, and Thoughtseize effects should contain that deck just fine. I’m wary of adding cards to the sideboard that don’t address specific problems that I know exist. Small Zoo, for one, looks like a problem for your deck. A Sprite will be a nice tempo swing, but when you’re getting bombarded by 1-drops that are bigger than anything but a well-fed Goyf, it’s a problem. CoCo Zoo will also be a problem, though less so. Damnation (or EE on 2, but that one has more friendly-fire issues) also helps against the likes of Merfolk, which historically has beaten the tar out of decks like Faeries. It also makes a lot more sense when you’re advocating a IoK-for-Peppersmoke swap (as I currently am). I disagree with the notion that IoK is always a tempo-negative play, though. Ripping out an aggro deck’s 2-drop of choice can throw their whole curve out of whack and give you a pretty significant advantage. Furthermore, IoK’s inability to interact with resolved permanents feels a lot less bad in a deck with Abrupt Decay. I think the number of decks where a Peppersmoke feels bad in hand is greater than the ones where an IoK does. Grindy mirrors are already very easy to win. I don’t mind only losing to one tier deck. Very happy to see some experimentation with BUG. I think this color wedge represents a very untapped area of deck building for Modern. Bitterblossom is a huge long game play that dodges most mainboard removal aside from decay, and spellstutter is a fantastic anti path/bolt/visions tempo pressure play. I feel like this deck is only a single innocuous reprint effect away from becoming a big player. Something like innocent blood would be a really nice card to shore up a variety of matchups. I was surprised not to see any simic charm in the 75? Works well with Disrupting Shoal and I know you have a liking for the card! Also have you ever considered Commandeer in any of your lists? I feel like it has a place in the board in the tron matchup – gimme dat plainswalker! Too cute? Just a thought. Negate is probably where you want to be. Thanks! A U/B version cashed at the GP, as mentioned in the article. Personally, I don’t think U/B is where interactive decks want to be in this format. Maybe you own Lightning Bolts? This looks really cool. Might have to give it a whirl. I’ve been following your posts here very closely for a while since I’ve wanted to change from playing Jund and I thought the tempo style gameplay would suit me better. I’m on Monkey Grow right now (not enjoying that much success ’cause this deck is hard as f**k to pilot, although I’m learning) but I have to say, I absolutely love this list. It has everything I love about Magic i.e. BUG Colors, Tarmogoyfs, Visions, Counterspells, Snap and removals. Stupid question first… It seems to me that you’re running a lot less blue spells than your other lists with Disrupting Shoal. Can you still support it? Keeping in mind that, being a D&T player in Legacy, I have no idea about the math with FoW. How does the game feel like playing compared to midrange strategies / your other tempo decks? Do you still retain that complex decision making? Does the game actually feel like tempo? Anyway, it looks like a lot of fun to play. I think I’m short 1 Snapcaster Mage and the 4 Bitterblossom of being able to sleeve up the deck. I’ll see if I have some spare cash after Christmas. This deck has a better time adapting to a midrange strategy than my grow decks, especially in game one. It does feel like tempo against a good chunk of decks, especially the slower ones like Twin and BGx. Glad you’re still on Monkey Grow; I took the deck to a Super Series last weekend and will publish a tournament report this Friday.